Honor 9, one of the most anticipated premium mid-rangers for 2017, is set to debut next week. Unsurprisingly, the device will have its premiere on home soil - a special event will be held on June 12th in Shanghai, China. An official poster for the event has recently surfaced on the web. As you can see, the company is clearly hinting that we're going to see a dual-camera setup on the handset. There are two circles next to the "9" which resemble a dual-sensor composition, while the poster itself is in black and white, meaning that a dedicated monochrome sensor could very well be a part of the camera setup. The guy in the poster is famous Chinese actor and singer Hu Ge, in case you're wondering. 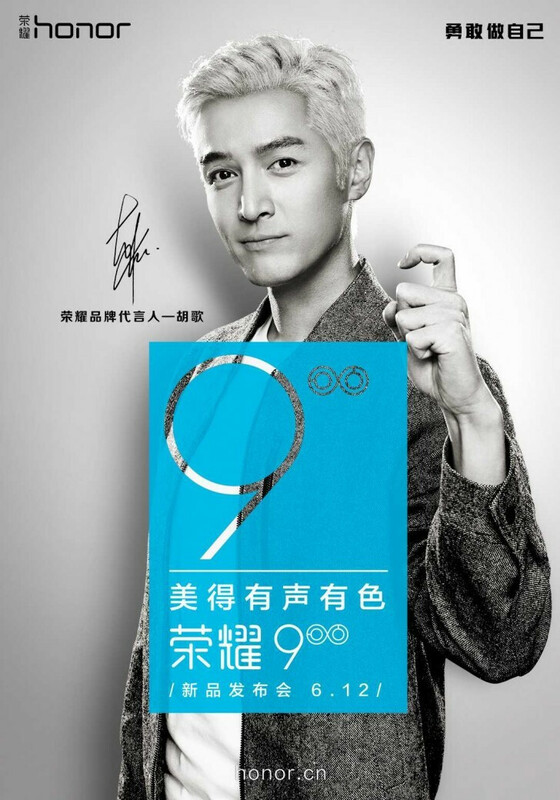 The sign he's making with his left hand is the Chinese hand gesture for the number 9, although it may seem like he's pressing an imaginary shutter button. Honor 9 will also allegedly premiere in Europe at the end of the month. A few weeks ago, popular tipster Roland Quandt uploaded what appears to be an official press invite for the announcement event that is to be held on June 27th in Berlin. Meanwhile, the handset has also been certified by Chinese regulatory agency TENAA, with the listing revealing most of its main specs. With everyone going bezel-less, I'm surprised Huawei is making them larger. Thats Huawei for you, behind the times. The p10 has a similar front, so I'm not really surprised. That basically looks like an s7 back + samsung old home button + iphone camera position. or the more obvious that it is a natural evolution from predecessors the Honor 6 (released 2014), Honor 6 plus (2014) & Honor 8 (2016).